Hey there, friends! 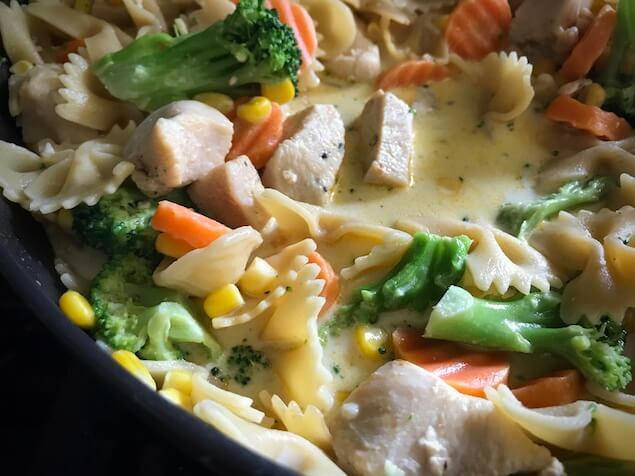 I’ve got One Pot Creamy Garlic Chicken and Veggie Pasta on the menu for ya to make as soon as humanly possible this week. 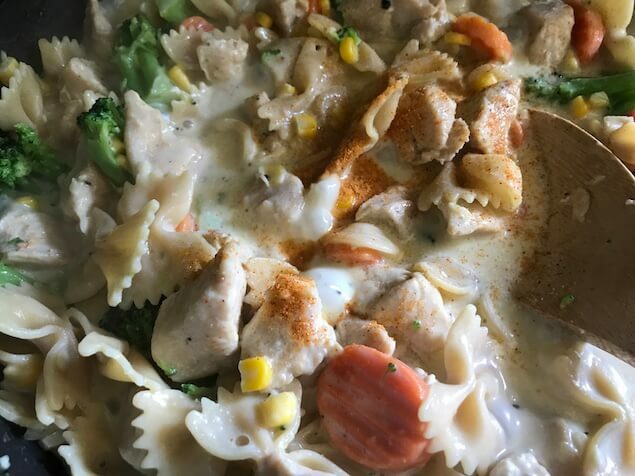 It’s filled with chicken, corn, broccoli, carrots, and finished off with a dreamy alfredo-like sauce. As always, lightened up just enough for ya! 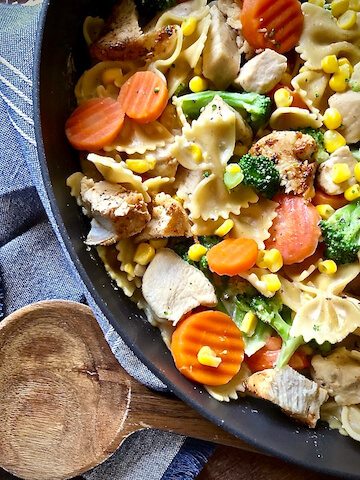 I don’t know about y’all, but this mama is all about the One Pot Pastas lately. One time, long ago, I found an old piece of paper crumpled up inside my mom’s recipe collection. It was called “Girl Scout Spaghetti.” Essentially it was regular old spaghetti except made in one pot, and the recipe was written to be cooked over a campfire. It sounded so delicious, I just had to try it out! And that’s the story of how I randomly discovered, and fell in love with, the “one pot method.” Ain’t it cute? By the way, if you happen to be wonderin’, yes I sure was a daisy, a brownie, and then a girl scout, but don’t ask me how to start a fire or tie a knot or sew or anything of the sort. I don’t know how to do that kind of stuff, but I can make eggs and bacon in a paper bag over a camp fire and my love for thin mints is very real. 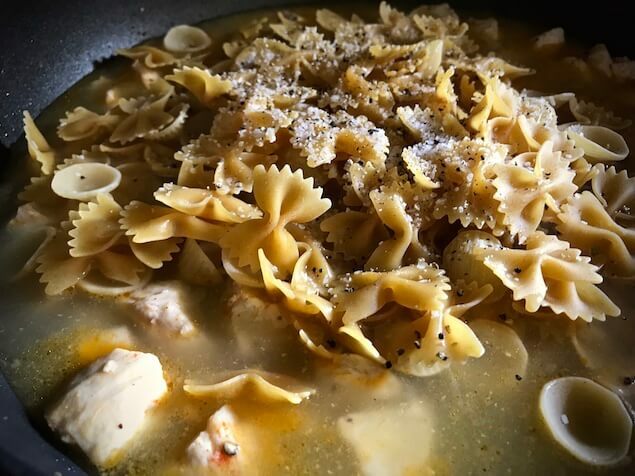 Back to the reason I’m writing this for ya today, I started making my One Pot Spaghetti Dinner years ago, because of that lil ol’ piece of paper. And then one day, it just kind of clicked- like, “Hey! I can make a lot of different pasta dishes this way. Duh!” It all began with my One Pot Alfredo Pasta with Bacon and Peas, and since then I’ve created a few others. 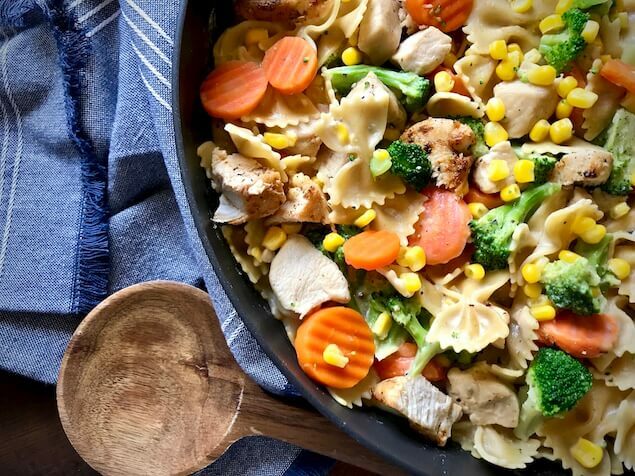 But this One Pot Creamy Garlic Pasta with Chicken and Veggies just might be a masterpiece! I’ve been making Pepper a lil somethin’ like this for months now, because she loves a good ol’ box of mac and cheese (probably a little too much), and I’m trying to- you know- broaden her horizons… as much as one can do with a three year old’s palette. 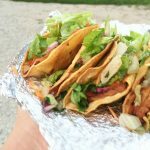 I decided that I needed to make it for this here blog because she loves this so much! And as a huge bonus, it’s loaded with good veggies, and it’s lightened up just enough for me to enjoy without any guilt! Eric just so happens to be a huge fan too, which makes this lady happy. 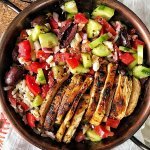 If I can get a healthy dinner done that everyone will love, and it’s all in one pot… well folks, I just feel really good about that. 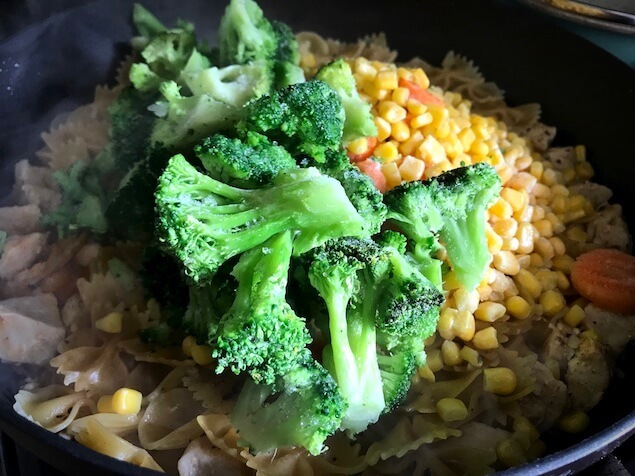 I think all of ya busy mamas and daddies, and anyone else who just doesn’t have lots of time for dishes but loves to cook (or just eat), will really appreciate this deliciously dreamy one pot pasta. So let’s get in the kitchen! Okay? Okay! Wait, one more thing. You’ll need to have a large pot or skillet with a tight fitting lid. I stress the word need. 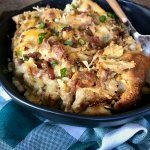 You can grab the trusty skillet that I adore on amazon right here just incase you want to be like me. Haha! But really, any pot/skillet with a tight fitting lid will do. First things first. 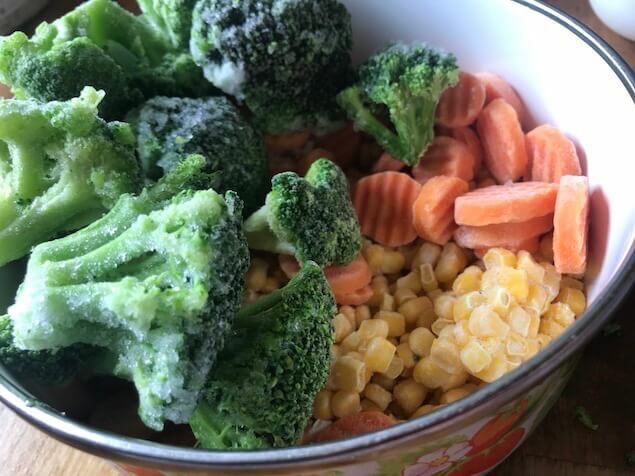 Grab some frozen corn, broccoli, and carrots! 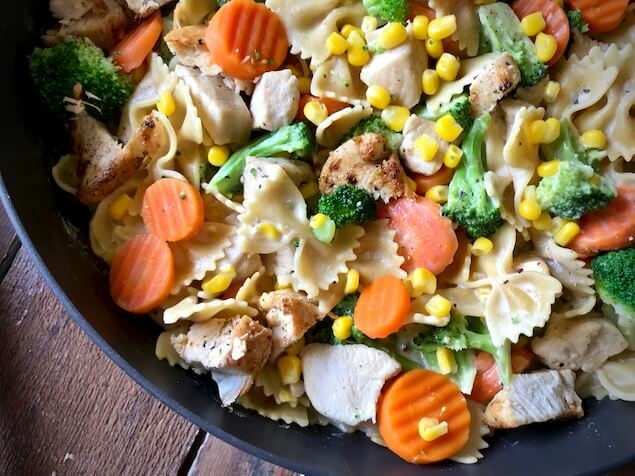 Let’m sit in a bowl while you get everything else ready to go. They’ll thaw naturally just a bit before adding them into the pasta. 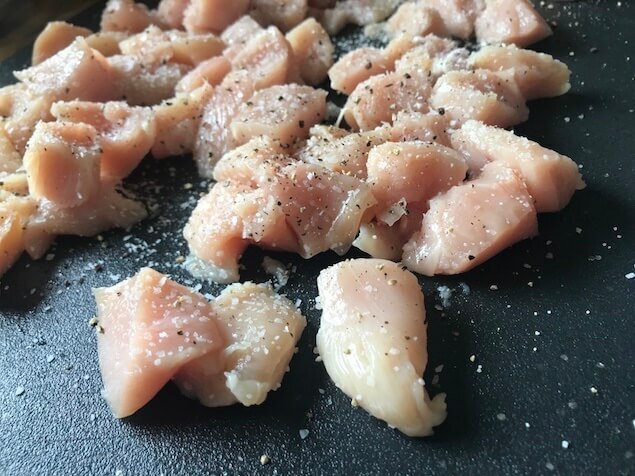 Now grab some raw chicken, cut it into small bite-sized pieces, and dust it with kosher salt. Then finish it off with some pepper. 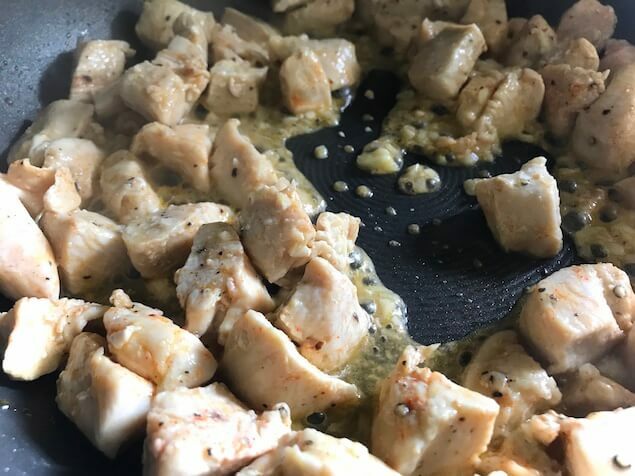 Over medium-high heat, warm up 2 teaspoons of olive oil, and cook the chicken in the skillet until lightly browned (about 5-6 minutes total), stirring every once in a while. It doesn’t need to be cooked completely, because it’ll be cooking with everything else as time goes on. 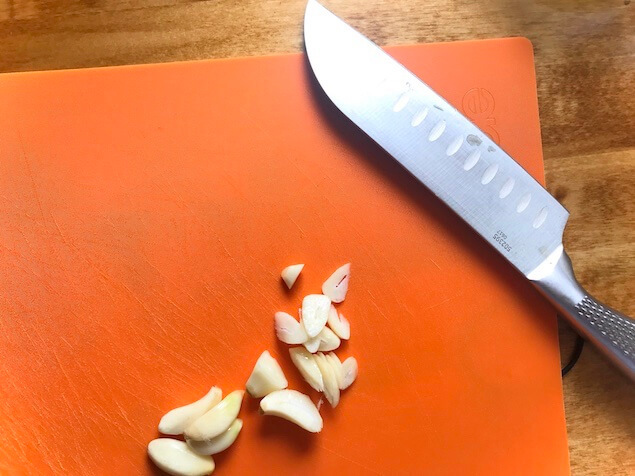 While the chicken is cookin’, mince up 6 cloves of garlic. When the chicken chunks are good to go, throw in the minced garlic and cook until it’s fragrant. Then, add your dry pasta! Now a couple more pinches of kosher salt and a lil freshly cracked pepper! Then pop the lid on the skillet. Bring’r to a boil, reduce heat to a simmer, and let the pasta cook for about 12 minutes (or until noodles are tender). 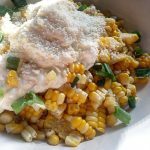 While you’ve got your pasta cooking, put about 1.5 tablespoons of Corn Starch into a small bowl. Add in 1 tablespoon of water. Whisk it together well with a fork, and set it aside. Remember that bowl’a frozen veggies? 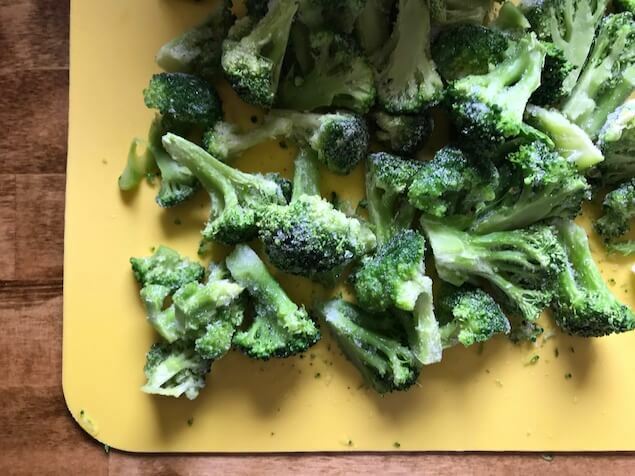 Grab the broccoli and just cut it up into smaller chunks. If your broccoli is already on the smaller side, just disregard this step. The particular brand of frozen broccoli that I always get just happens to be kind of large- I cut it up a bit before adding it in to dishes like this, so it spreads out evenly in the pot and steams a bit faster. Now, throw all those goodies in, okay? The broccoli, the corn, and the carrots! Stir’m in real good. Aaaand pop the cover on again for just a few minutes to let the veggies steam up a bit. Add in one and a quarter cups of half and half, and a quarter cup’a grated Parmesan cheese. Bring to a gentle boil. Remember your lil’ slurry? You need it now. Give it a quick whisk with the fork, because the corn starch has probably settled a bit after setting there for a few minutes. 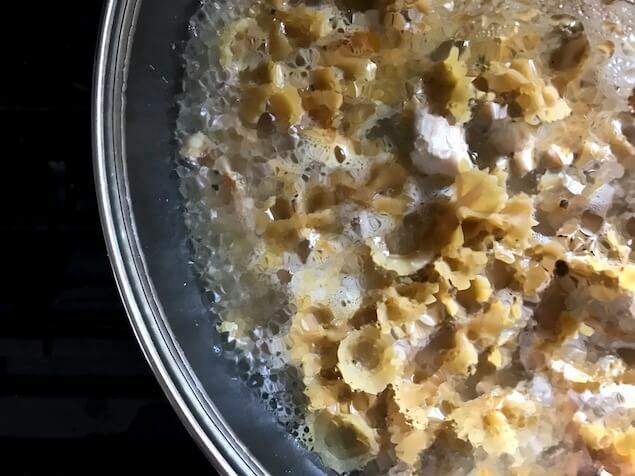 Add the slurry into your lightly boiling pasta mixture and then stir frequently until the sauce thickens (about 3-5 minutes). Add some Lawry’s seasoned salt, 1/2 teaspoon or to taste. And that’s it friends, we’re done! I told ya it was creamy and dreamy! Make this up riiiiight nowwww!! 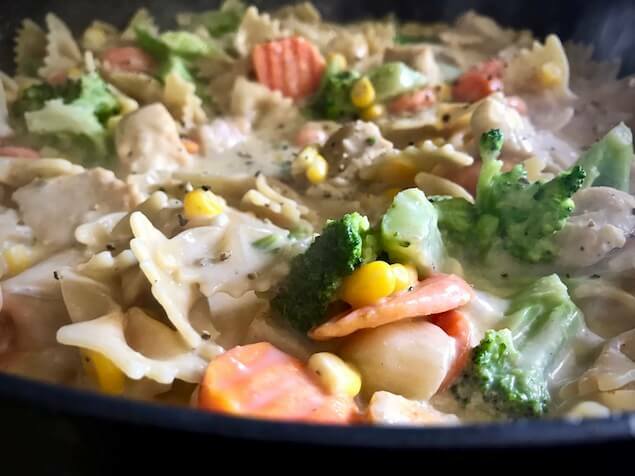 A family friendly, quick, and easy one pot pasta filled with garlic, pasta, and vegetables, and finished off with a to die for creamy sauce. 1/4 tsp Lawry's Seasoned Salt or to taste. Heat a large skillet or pot with a tight fitting lid over medium-high heat and heat 2 tsp olive oil. 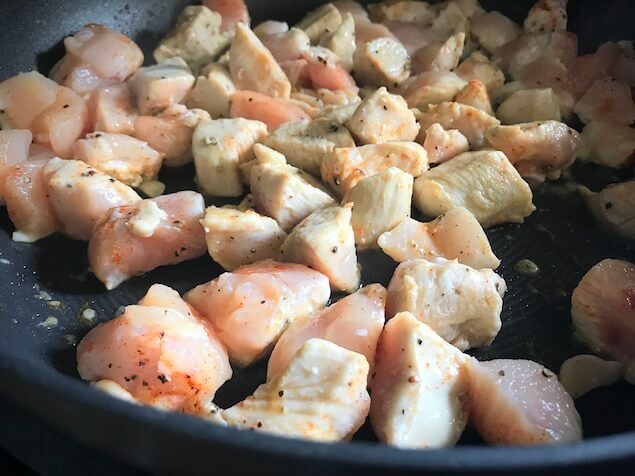 Add diced chicken breast to hot pan and cook until lightly browned and cooked through, about 5-6 minutes. Stir occasionally. 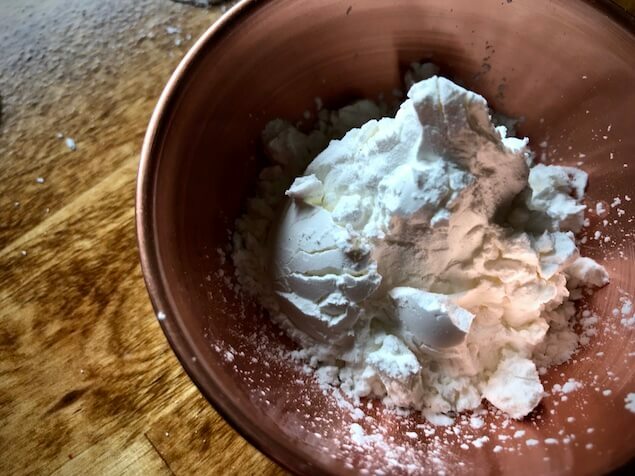 Make Slurry by adding 1.5 tbsp of cornstarch and 1 tbsp of water to a small bowl and whisking it with a fork until combined well. Set aside. 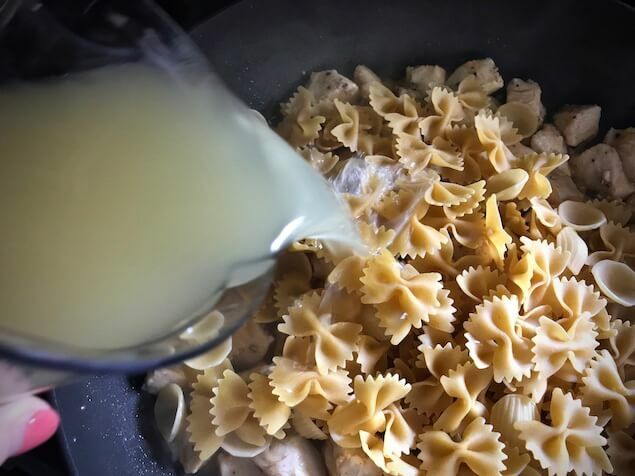 Stir in half and half and parmesan cheese. Bring to a gentle boil and add slurry. Continue to stir together for a few minutes until thickened. Season with Lawry's Seasoned Salt and Pepper to taste. Enjoy! Serving size: 1 & 3/4 cups. 7 Freestyle Smart Points. 410 calories, 10g fat, 5g saturated fat, 37g carbohydrates, 4g fiber, 3g sugar, 38g protein. First, THANK YOU! This doesn’t get its creaminess from yogurt. I’m so sick of yogurt! So, I made this a few weeks ago and misread the recipe and dumped 1.5 cups of cheese. I was so upset! It was still delish, but I could only eat like two bites . I tried again tonight. Oh MY word. Just amazing! My fiancé even loved it. I did however use peppers instead of frozen veggies since I have a carrot allergy and picky eaters. This will be a regular meal over here! Looks good! I make something similar with broccoli, carrots and cauliflower instead of the corn. My mom made it for us growing up- good with or without the chicken! Whats the lawry’s seasoned salt. I don think i can get it here. I see you used kosher salt and this. Can i just use tablet salt for this? Hey there, not sure where you’re from, but it’s usually in the aisle with the spices. Reduce the amount of salt if using table salt, always otherwise it’ll be a bit too salty. Hope that helps! My husband could not stop saying, wow this is really good! and I totally agree, so easy and so tasty! Thanks Star!! Hey Tabitha! oh my gosh, so happy you and your husband loved it so much! 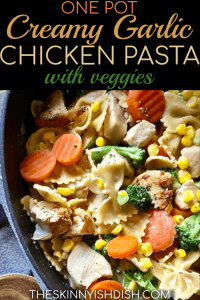 Made this tonight with a couple of subs because I was trying to use what I had on hand and it was DELICIOUS!! Husband and kid approved! 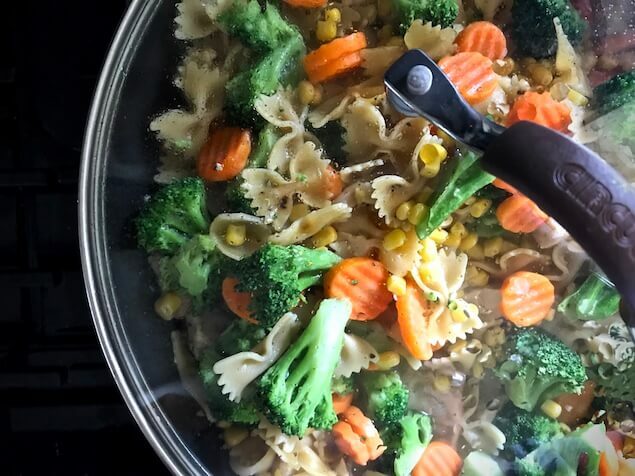 I used a bag of mixed frozen veggies (corn, carrots, peas, and green beans) and used fat free half and half. I’ll definitely be making this one again…and again. Thanks for another great recipe! When you say grated Parmesan, do you mean the kind in the plastic jar that looks like powder that you sprinkle on spaghetti, or do you mean real Parmesan? Hi Cynthia I always use real grated parmesan not the stuff in the can on the shelf. You can buy it already shredded/grated in the refrigerated section near the other cheeses or you can buy a block and grate it yourself. 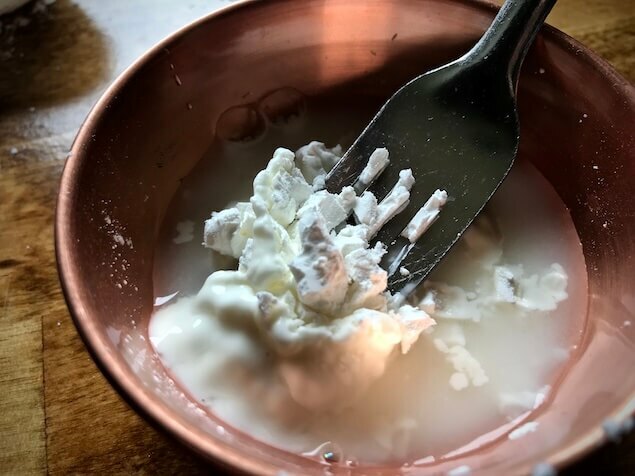 CouldI use fat-free Greek yogurt instead of half and half? I personally have never tried it so I’m not really sure what would happen with it. If you’re looking for a lower point option you could use fat free half and half. Do you think unsweetened almond milk and lactose free Parmesan would work ok in this? Made this last night. It was delish! We ate almost the whole pot! I’m so happy you enjoyed, Jenny!! Thanks for letting me know. 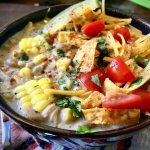 Can this be done in a slow cooker ? 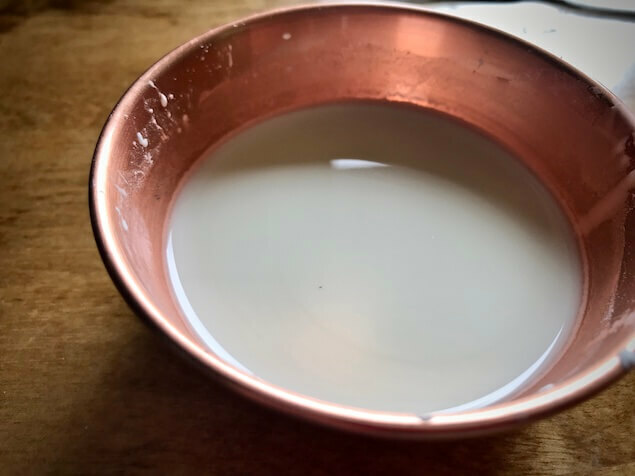 Could you use milk instead of half and half? 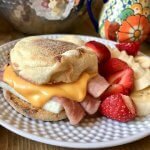 Sure can, but it might not be as creamy.Hope you enjoy! Do you think I could use milk instead of half and half? Yep! It just might not be as creamy. Enjoy! When I run this through recipe builder I’m getting 9 points per serving. 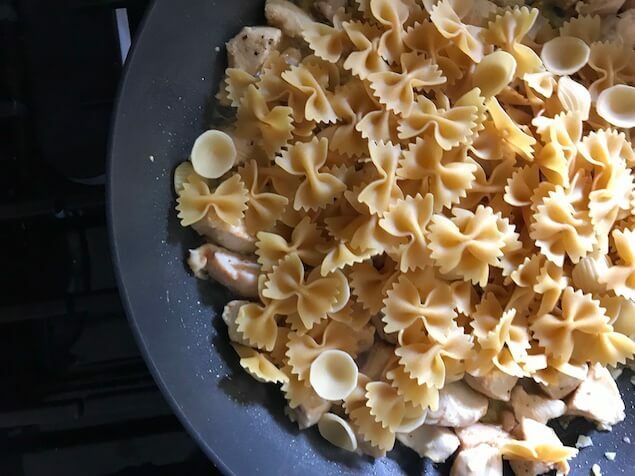 Are you using regular pasta and regular half and half? I’m getting 22 points for the half and half and 20 points for the pasta. Yes. I use regular half & half and pasta. 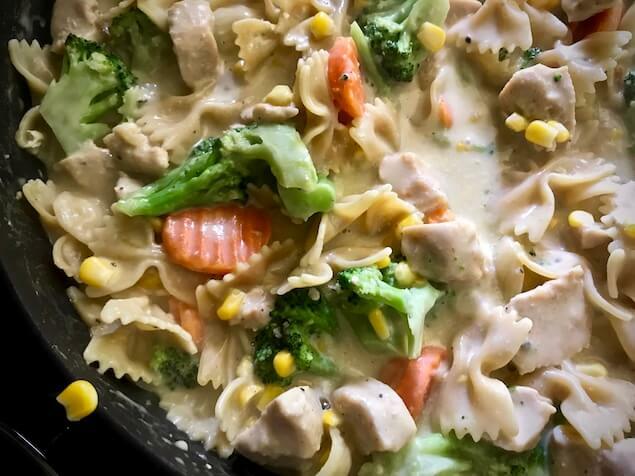 Are you using the nutritional info to calculate the info or the building the recipe in the official recipe builder on weightwatchers.com/the ww app? I’m the same as Diana. 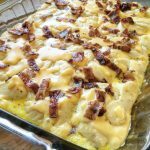 It’s coming up as 9 points and I use the official recipe builder on the website. I can’t have dairy? Do you think dairy free milk would work? Is the cheese needed? Made this tonight and was amazing! Look forward to trying more of your recipes! Thank you! 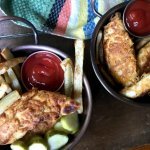 Just made this for dinner last night – and it was a hit with the whole family! The flavor is great, and I loved all the veggies. I used whole wheat bowtie, as that’s what I had on hand, and the boys (7 & 4) didn’t even notice. I also used fresh broccoli, just steamed it a bit before adding it to the pot. This made a large portion of food, so we have leftovers for lunch too! 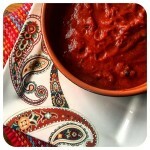 Thank you so much for a delicious recipe that will go in the monthly rotation for sure! – how big is your skillet? – Can you suggest a replacement for season salt that doesn’t have cayenne powder or paprika? I am allergic. 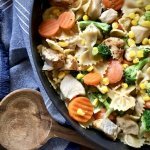 I love the idea of a 1 pan pasta recipe! Made this tonight, used rotisserie chicken from Costco and it was delicious. A keeper recipe for sure! Do you use regular half and half? Just made it! Waiting impatiently for it to cool down so we can eat it!!!! This looks wonderful! I am going to try it this week and pass it along to a friend who is on Weight Watchers. Thank you! 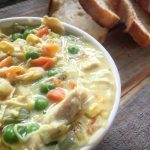 Would chicken broth work or does it have to be stock?